Click here to see Artists Participating this year! "In celebration of the 56th Annual General Clinton Canoe Regatta, the Jericho Arts Council (JAC) has teamed up with the Bainbridge Chamber of Commerce, Golden Artist Colors, regional businesses and artists to create the Bainbridge Arts Trail - "Regatta Row". This year's theme, "Scenes of New York" will be displayed in an outdoor exhibition of artist designed, Adirondack style "Chairs and end tables". Each unique piece has canoe paddles incorporated in the design; the End table top is 20" x 20" square and has three paddles. They will be displayed on Main Street (Intersection of Routes 7 and 206) in historic downtown Bainbridge starting with the Streetfest on April 28 and on throughout May and then be auctioned at the Regatta to benefit the Jericho Arts Council. The iconic Canoe Regatta draws close to 15,000 people for Memorial Day Weekend and is the longest flat-water canoe race in the world, culminating at the finish line in Bainbridge. ​Click here to see the student painted Paddles ! ​On Saturday, April 28 from 2 to 4:30 pm, the Bainbridge Art Trail-Regatta Row will open with a dynamic Street Art Fest!!! Centering at Town Hall, 15 N. Main Street, the Jericho Arts Council Gallery Committee hosts the 4th annual opening of Regatta Row -Street Art Fest. The public is invited to a unique afternoon of art, live music and merchant hospitality. Save the date to come out with family and friends to "Meet the Artists" and listen to the 24 musicians playing all through town from Bob's Diner to Jerry's Inn. Due to their generosity, local restaurants including Bob's Diner, S & S Cafe, Rosa's Restaurant and Pizzeria and Jerry's Inn, will be serving a specialty item at no cost to the public. B & W. Wines and Liquor, LLC will have a wine tasting. Small Town Perks, our new coffee shop in the village, will be having their Grand Opening Celebration that day also. Merchants will be giving away free gifts and goodies. The event is free thanks to the Bainbridge businesses in appreciation for the public's continued patronage. 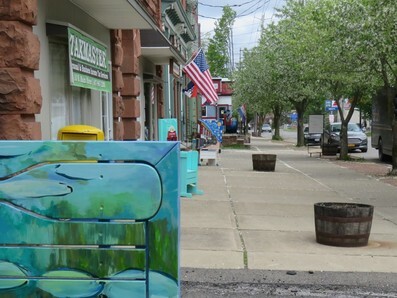 ​The artist-designed Adirondack "Canoe Paddle Chairs" & "End Tables", will be on exhibit in downtown Bainbridge from April 28th until May 25th. The tables & chairs are built by Dan Stoltzfus of Riverside Farm, and will be auctioned at the General Clinton Canoe Regatta grounds on Saturday, May 26th at 3pm, in the big red & white Chamber of Commerce Tent. Bainbridge Chamber of Commerce, Lambrecht Auctions and many other local businesses and individuals. ​"This project is made possible with public funds from the Chenango Arts Council​'s Decentralization Grants Program, a re-grant program of the NYS Council on the Arts, with support from Governor Cuomo and the NYS Legislature"